by Fitrian Ardiansyah, 3 December 2015, Paris, Indonesia Pavilion, COP-21, UNFCCC. These remarks were taken from my presentation and discussion that contributed to a panel discussion on Natural Forest: Production and Conservation. (1) IDH’s Tropical Timber Program has been working in three important tropical regions: i.e. Amazon, Congo Basin, Indonesia. We support and co-finance efforts of concessions and others to achieve certified sustainable forest management. In each region, the aim is to obtain 4 million ha of credible certified SFM (sustainable forest management). In Indonesia we collaborate with and support The Borneo Initiative and many concessions. The progress in Indonesia is that 1.5 million hectares have been certified (fully or control wood) and more than 2 million hectares are still in progress. (2) We also work in the demand side, ensuring the uptake and market access of that SFM products. (3) To achieve sustainability, addressing legality is a must and can act as a starting point. In our view, there will not be sustainability without legality. Initiatives like SVLK (timber legality verification system) in Indonesia should be encouraged and supported. (4) Individual SFM and concessions are good but still insufficient, especially if we want to address cross-cutting issues and challenges. These include wildlife management and protection, fire, peat and water management, high conservation values and social dimension. These concessions – albeit having certified SFM – still need to work together among themselves and with other land use actors, including oil palm plantations, industrial timber plantations and communities. Based on this, selecting a landscape approach as a platform is imperative. (5) In a landscape approach, not only regulations that would be crucial to guide collaboration, incentives need to be created so that better behaviour of land use actors can be ensured. Ardiansyah F, Marthen AA and Amalia N. 2015. Forest and land-use governance in a decentralized Indonesia: A legal and policy review. Occasional Paper 132. Bogor, Indonesia: CIFOR. This report is a legal and policy review of the powers of key government agencies and lower-level governments and the relations among these different agencies at different levels (e.g. the relationship between the local and central governments) in forest and related sectors. The focus of this review is to identify a particular government agency or level of government that has the legal power to make resource decisions in different spheres related to forests, land use affecting forests and/or benefit sharing, including REDD+. It aims to provide an understanding of the legal basis for the powers of such agencies or a level of government. The review also examines different key actors in each sphere (including whether these agencies can make certain decisions according to the laws and regulations), the differences among agencies, and the scope of authority of lower-level governments. The review in this report contains an introduction and four main sections. The first (Section 2) describes the division of responsibilities and power across the different levels of government. It provides a general overview of powers (e.g. the extent to which they are permitted to legislate or make decisions) and responsibilities as established by decentralization laws and policy, budget distribution as established by law, and other relevant aspects. This section addresses issues related to the overview of different levels of government in Indonesia, including the evolution and process of decentralization; the definition, scale and scope of regional autonomy/decentralization powers; the powers shared among agencies at different levels; and other relevant aspects. The second section (Section 3) is on financial resource mechanisms and distribution. It serves as a background for the on-the-ground study of benefit-sharing mechanisms (e.g. actual and potential with regard to REDD+). This section seeks to address issues related to the arrangement of financial resources and the powers and responsibilities over them assigned and distributed among the different levels of government. Such responsibilities include forest fees and other royalties, as well as any existing benefit or incentive schemes (e.g. payment for ecosystem services, or PES) aimed at maintaining forests or promoting sustainable forest management or REDD+. Section 4 describes the role that different levels of government play by law in the following list of land-use decision or policy arenas affecting forests: (1) spatial and land use planning, (2) defining the vocation of the land and conversion rights, (3) the titling of agricultural land, (4) the titling of indigenous land within forest areas, (5) the governments’ ownership and administration of the land, (6) natural protected areas, (7) mining concessions, (8) forest concessions, (9) oil palm, and (10) infrastructure. This section uses summary tables as far as possible, describing the division of responsibilities among the different levels of government, including in the making of formal decisions, which procedures are used, and the division and balance of powers across functions (i.e. in establishing policy and norms, authorizing, administering, controlling and monitoring, and auditing). The last section (Section 5) further explains the role and opportunities for indigenous (adat) law. This includes a review of the definition of adat law and the legal basis for communities making land claims based on such law. This section discusses challenges and opportunities for adat law to be further recognized in the Indonesian legal system. Can we realize a ‘sustainable landscape’? The global population and the demand for food, fiber and fuel are sharply on the rise. As a consequence, there is a constant question whether our human civilization can meet such demand while ensuring that our resources, landscape and ecosystems can be sustainably managed for the long-term. In Indonesia alone, the Agriculture Ministry projects that there are 23.3 million tons of rice needed in 2015 and 28.1 million in 2030 to meet the demand of 255 million and 308 million people in the corresponding years. It is clear that threats to food security will grow as the population continues to soar and economic activities develop, while land availability becomes more limited. Indonesia’s primary energy supply and demand per capita show that the country remains relatively strong in the context of energy security issues, indicated by a sufficient energy provision per capita. Data in 2013, however, show that the average growth of supply was only 3.5%, below the average growth of demand at 4%. Without proper interventions and measures, Indonesia is likely to have an energy security issue in the future. Development of Indonesia’s land and resources is also driven by the global demand. Palm oil is a prime example of this. The skyrocketing global demand for vegetable oils has pushed land development all over the tropics including in Indonesia. Currently, this commodity is grown on 16.4 million hectares worldwide and more than majority of the production is in Indonesia and Malaysia. Global and domestic demand for coal, to some extent to compensate the shift from oil dependency, has dramatically increased the production of coal. This is indicated by a persistent growth of production of coal, with the proportion of export reaching above 90% in the period of 2007-2009, as reported by the Energy and Mineral Resources Ministry in 2012. Meeting such demand would require Indonesia to continue exploiting its resources and land. These development activities would certainly impact on local communities and our remaining fragile ecosystems. The development agricultural, forestry and energy sectors contribute to the country’s economy but at the same time, as a result, water, land and other natural resources are becoming scarcer. The use of water for agriculture, mining and industry means increased competition among cities, industrial estates and farmers. Concerns are also growing about the large-scale overdraft of groundwater and water contamination from agricultural runoff, and industrial and mining waste. The increased use of land, the conversion of forests and the extraction of natural resources, mean continuous deforestation, and ecosystems and land degradation. In addition to direct forest or ecosystem conversion, poor soil management practices, frequent use of heavy machinery and improper use of technology lead to a significant reduction in the productive capacity of land. Furthermore, the growth of land use and land use change can create disputes over land rights and ownership leading to conflicts, with other land users, local and indigenous communities. Deforestation and the expansion of land for agricultural, industrial and mining use also exacerbates climate change, contributing to greenhouse gas emissions, from draining peat lands and clearing natural forests. Based on the above situation and future trends, initiatives to address land and water issues in the context of landscapes are urgently needed to be developed and realized. Such initiatives ought to be inclusive and more importantly acknowledging the role of agricultural, industrial and mining production as contributors to problems as well as solutions. There are an increasing number of commodity companies, linking to international market, that have developed initiatives to mitigate their direct impacts on land and water through supply chain management initiatives. There are also mining companies and associations that produce best management practices and industrial codes regarding land, forest and water management. These sustainability standard attempt to incorporate indicators that impact social, land and water parameters beyond the production area. But these standards primarily regulate practices in farming, forest and mining concessions so that these concessions or firms can be certified. Areas outside the concessions, including important ecosystems in the buffer zone, wildlife corridors, and land utilized for indigenous communities may not be incorporated or supported. In the context of a landscape, these corporate sustainability standards contribute to the betterment of environmental management, but only in concession areas. Such standards may leave huge gaps and still lead to undesirable environmental and social impacts for a particular landscape. Landscapes are patchworks of interlinked pieces of land, ecosystems, water and species (including human). It is, therefore, important for the existing sustainability standards and corporations that are involved in such standards to invite and work together with other corporations, government bodies, organizations and communities to realize a better environmentally managed landscape. Realizing a healthy mosaic landscape requires a challenging multi-stakeholder approach. This is because ownership of, responsibility for, and impact on a landscape lie in the hands of a multitude of stakeholders. Also, different stakeholder groups (such as local and regional governments, companies from various sectors, local farmers and communities) can have very different perspectives and thus different incentives to want to look beyond their own direct interest. Front-runners of sustainability, both from corporations, government bodies and civil society groups, need to join forces so that an initiative to promote sustainability at a landscape level can be realized firmly. They can act as ‘movers and shakers’ in convening different stakeholders and garnering support from them, building public-private-NGOs-community partnerships as a way to transform agribusiness and energy markets to sustainability, from a bottom-up landscape level. At a landscape level, for such movement to be successful, a shared-vision and model of sustainable land and water management need to be formulated and agreed by different stakeholders. These vision and model are crucial to be used as the basis for addressing issues and finding solutions at the landscape level. Government regulations and relevant legal framework and innovative incentives are also imperative to ensure that this landscape initiative can be sustained in a longer term and land users can be supported. If a sustainable landscape initiative can be matched with existing sustainability standards at the global and national levels, learning, innovation and improvement can be generated and desirable environmental and social impacts can be achieved. If this is the case, a viable governance model from the landscape to global level that supports sustainable practices is not only considered feasible but may well be one of key solutions that many stakeholders involved in land-related development sectors have been searching for. Reducing deforestation and protecting the fragile environment while promoting forest production have been proved to be a challenging task for the previous forestry ministry. The merger of the environmental and forestry ministries into one agency is expected to at least ease the level of deforestation that is relatively high in Indonesia. There are a number of challenges to achieve such an objective. Traditionally, the forestry ministry has duties and functions to formulate and implement any government affairs in the field of forestry, including the designation, management and monitoring of the national forest estates, covering approximately 134 million hectares (70 percent of Indonesia’s land surface) in 2011. In the same year, however, it was reported that only 98 million hectares of these national forest areas were still forested (52 percent of the land surface). Other sectors and activities such as agricultural plantations and mining have been blamed for such massive forest loss but since the forestry ministry has also been pushing to continuously perform by increasing Indonesia’s export of timber related products, including plywood and pulp and paper, the ministry is also significantly responsible for continuous deforestation. Several regulations, used as a regulatory framework to support the forestry ministry, clearly facilitate and support individuals, cooperatives, corporations and other entities to harvest and exploit timber and other forest products in the remaining forest areas. These, among others, are Government Regulation (GR) No. 7 of 1990 on Industrial Timber Plantations, GR No. 51 of 1998 on Forest Resource Rent Provision, GR No. 3 of 2008 on Revision of GR No. 6 of 2007 on Forest Planning and Formulation of Forest Management and Utilization Plan, Minister of Forestry Regulation (MoFR) No. 35 of 2008 on Permits for Primary Forest Industrial Activity, and MoFR No. 50 of 2010 on Granting Licenses for Timber Production in Natural Production Forest. In contrast, the environmental ministry has the government’s duties to protect and sustainable manage the environment, including the formulation and implementation of national policy and program, the regulation of environmental impact assessment processes, and the collection of relevant environmental data. This ministry has a big stake to support forest protection and conservation. Unlike the forestry ministry, the environmental ministry has no direct control over particular forest areas, although they can conduct environmental monitoring. This ministry also had limited budget and personnel. In some cases, the environmental ministry has proved to be effective in monitoring environmental protection as well as prosecuting those suspected to be violating environmental regulations. One of recently few successful cases is the local court’s ruling in Aceh in January 2014 that found a palm oil company, guilty of illegally burning forests within the Tripa peat swamps, considered as part of the protected fragile Leuser Ecosystem, and has to pay a fine of approximately US$9 million as compensation and US$21 million for restoration activities of the affected forests. In this situation, the environmental ministry was seen as an instrumental part in ensuring law enforcement in the land use and forest sectors. The combination of environmental and forestry ministry, if both capacity and capability can be effectively utilized and coordinated, can lead to better law enforcement activities, signaling the seriousness of the current administration to uphold and execute the law and regulations. This combination, however, can undermine forest protection and conservation, and sustainable forest management, and lead to further deforestation, if exploitative nature of forest and similar industries appears to be dominantly coloring the decision of the combined ministry. The environmental ministry, according to Law No. 32 of 2009 on Environmental Protection and Management, for instance, has been given a slightly greater control over monitoring and reviewing other governments’ policies and permits, especially if these have potential environmental risks. Such authority to review other government’s policies and permits can be strengthened within the combined ministry especially with the fact that the current combined ministry has presumably more human resources and budget. The combined ministry can, however, undermine the role of the previous environmental ministry to review and monitor and, to some extent, control environmental management and protection, in the case of forest and land management, if decisions have been made internally to prefer forest exploitation. When it comes to laws and regulations on environmental and forest protection, the combined ministry at least now has a more than sufficient legal umbrella, including Law No. 5 of 1990 on Conservation of Biodiversity and Ecosystems, GR No. 60 of 2009 on Revision of GR No. 45 of 2004 on Forest Protection, in addition to Law No. 32 of 2009. To show that the combined ministry has become better in promoting environmental and forest protection, the ministry can use specific regulations previously utilized by the forestry ministry to deal with few upcoming challenges, including the recent Aceh provincial spatial plan (Qanun No. 19 of 2014) that does not mention the world renowned Leuser ecosystem, and the importance of its protection. The home affairs ministry has responded to this plan and mentioned that there are 27 points needing to be corrected or revised by the provincial government. The new environmental and forestry ministry can assist the home affairs ministry and the provincial government by showing that there are regulations such as PD No. 33 of 1998 on Leuser Ecosystem Area Management and Presidential Instruction (PI) No. 5 of 2001 on Eliminating Illegal Logging and the Illegal Timber Trade in the Leuser Ecosystem and Tanjung Puting National Park that need to be followed by the provincial government and incorporated as a regulatory framework of the provincial spatial plan. The combined ministry can assist the provincial government and other sub-national governments to develop their respective areas by basing on the principles of sustainable development and green economies. The combined ministry can further work together with relevant ministries, including the finance ministry, to develop further incentives so that other government’s ministries and local governments to mainstream and implement such principles. The current administration has decided to combine environmental and forestry ministries. Only with the actual outcomes on the ground, such as reduced deforestation, that this administration will be considered successful compared to the previous one. The combined ministry now has the chance to prove to the general public that combining both ministries is the right decision for the sustainability of Indonesia. 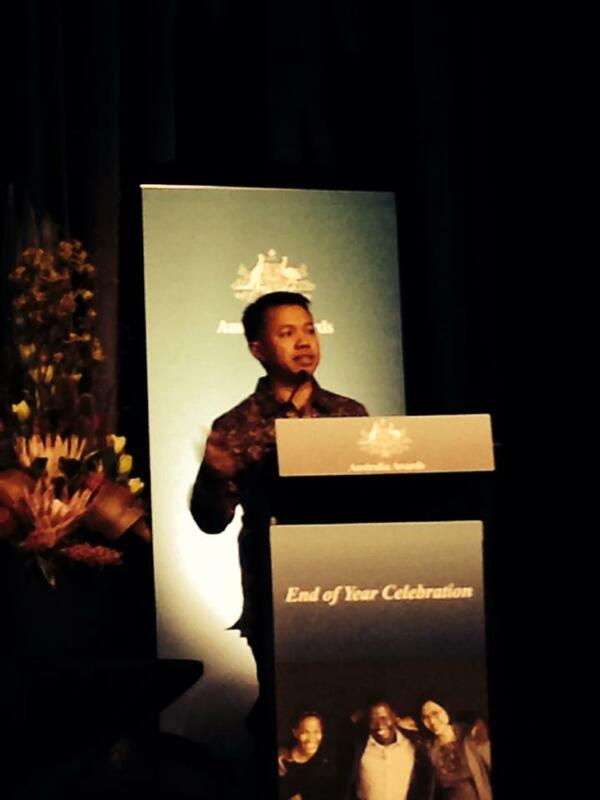 17 November 2014, National Convention Centre Canberra, by Fitrian Ardiansyah (Recipient of Australian Leadership Award and Allison Sudradjat Award), PhD Candidate at the Australian National University. Good afternoon! And congratulations to all my fellow awardees who – I believe – are excited to be able to finish our study, or start their journey to study here in Canberra. I believe we are also curious about our uncertain future when we are coming back homes or starting our study. Well, let me tell you something, the future will always be uncertain, as the famous Albert Einstein once said “As far as the laws of mathematics refer to reality, they are not certain; and as far as they are certain, they do not refer to reality.” And by the way, this is also the framework and often stages of my PhD thesis, if you are uncertain with your thesis or study, this means you are in the right direction, because if you are so certain about your thesis or study, there is something wrong with your thesis or yourself. That is why when many of my friends often asked about my thesis, I often answered, well it was there but it was not yet there – with a big grin on my face. However, I believe we all know that our future will be much exciting than our present or past. For those of you who were brought up by watching Star Trek, 2001 or many sci-fi movies in the 1980s (now you know how old I am), you would not believe yourself that one day you could communicate wirelessly, in real time, for instance. During my childhood, I remember vividly that the easiest way to connect wirelessly with someone else was to throw a scramble piece of paper at his or her head to get his or her attention, or really shouting from the distance like you are crazy or Tarzan like (without having to be naked of course). I am an optimistic guy and hence I totally agree to what Mr Winston S. Churcill once said “A pessimist sees the difficulty in every opportunity; [but] an optimist sees the opportunity in every difficulty.” I hope we can always overcome challenges in our future pathways and, in fact, change these into opportunities to make us better and to make the world a better place. Well, one of the reasons why I am quite optimistic is because of my daughter, as you can see that I am taking her with me now (well, another reason to take her now is that I cannot afford anyone to babysit my daughter – the scholarship is running thin now :-). If I cannot change myself, my surroundings, my country and of course the region that I and we live in, the ones that will feel the most impacts, are her and her generations. I have been working and researching on environmental and economic issues and I believe we are connected to one and another and what we do, regardless whether it is small or big, will influence our life, now and in the future. A good lesson-learnt while I was studying and living in Australia and discussing with scholars and many people alike is that you are the one that control your destiny. You are the one that can change the future of yourself and your country, and whether it is small contribution, it is still big in the realm of our world, especially if we do it together with our colleagues, friends and many like-minded peoples. “If you think you are too small to be effective, you have never been in bed with a mosquito”. That was a quote from Bette Reese, an American officer and pilot. With this quote, I will remind myself from now on to be as an effective person as if I am a mosquito, influencing myself and the world, bugging others with good messages, but hopefully not infecting others with malaria or dengue. And with this as well, I will end by saying huge thanks to the Australian Awards and the Australian Government that provide this rare opportunity to live and study in Canberra, at the ANU, as well as to all ANU academia and staff, friends in Canberra and other states, my peers, that provide enjoyable study and research life that I will cherish for the rest of my life. To my lovely wife and children, I love you so much. Good evening and enjoy your night! The General Elections Commission of Indonesia confirmed Joko Widodo as the winner of the presidential race winner a month ago, paving the way for the creation of a new government that will run for the next five years and address a huge challenge in managing the country’s natural resources. Although his opponent, Prabowo Subianto, refuses to admit defeat, many scholars and observers believe that Joko Widodo, or ‘Jokowi’ as he is popularly known, will be sworn in as the seventh president later this year. Officially, the Constitutional Court has to declare Jokowi as the country’s elected president. Nevertheless, whoever the Indonesian next president is, he needs to hit the ground running, taking responsibility for forming a government that can deal with difficult issues such as balancing the country’s economic development, social welfare and environmental protection. One immediate challenge, that the new president and his cabinet need to address, is regarding fossil fuel and energy subsidies. High energy subsidies create significant costs for Indonesia and its people, impacting on the economy, the environment and Indonesia’s energy security. Indonesia-Investment reports that the government allocated IDR300 trillion (US$26.3 billion) on energy subsidies in 2013 (mostly on fuels and electricity), and this year the government will spend at least IDR282 trillion (US$24.7 billion). for Sustainable Development, Ari A. Perdana argues that fossil fuel and energy subsidies do not support low-income households very efficiently and can effectively ‘crowd out’ government spending on alternative policies. renewable energy development, enabling Indonesia to secure its future energy supply and move toward a sustainable energy growth path. Jusuf Kalla, the running mate of Jokowi, told Reuters a month ago that a priority program in their first 100 days in office will include the reduction of fuel subsidies. This is likely to be the first big test for the new government since the issue of fuel subsidy reduction is a politically sensitive one. If the new government is successful to approach and address this, including to convince a ‘divided parliament’ and the general public, the new president and his cabinet have a good platform to create incentives for boosting Indonesia’s economic development, creating incentives for saving energy and finding renewable sources, and eventually reducing the country greenhouse gas emissions. 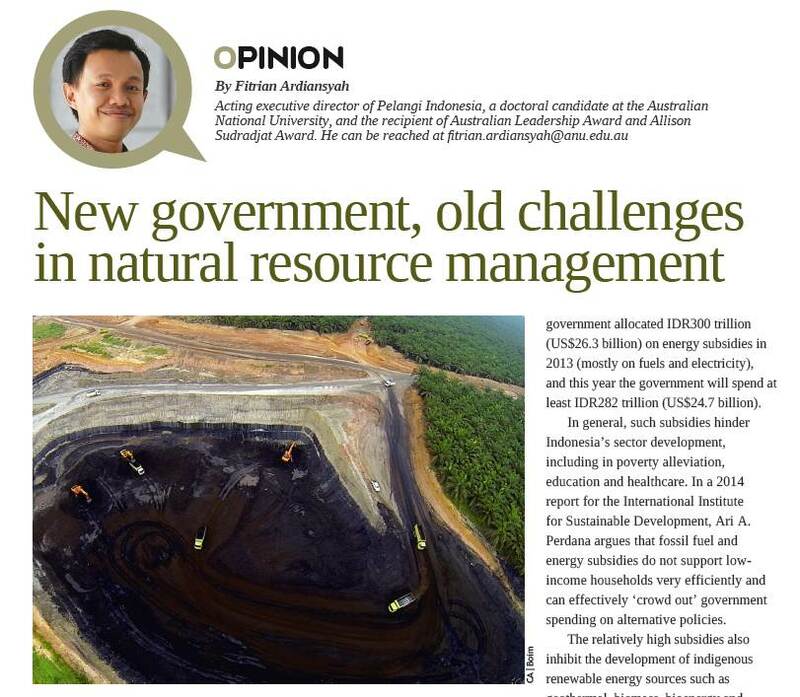 Another key challenge for the new government in managing the country’s natural resources is to formulate the future development platform of Indonesia, particularly whether the country will still depend heavily on natural resource exploitation. Continuous natural resource exploitation has contributed significantly to Indonesia’s economic strength but, at the same time, this has led to resource depletion, and environmental degradation and related disasters. The National Agency for Disaster Management (BNPB) reveals that for the period of 1815-2014, environmental and climate related disaster events have been prevalent, including floods (38 percent), strong wind (21), landslides (16), and drought (12). A study published by the United Nations Environment Program, for example, estimates that in the period of 2010-2013, flood events in Kalimantan have inundated more than 190,000 houses and displaced more than 700,000 people, resulting in significant social and economic costs. Such disasters reflect on the past and current natural resource management regime of Indonesia as a country, particularly in the management of (or lack of management of) its forests, agriculture, land and key natural resources. Such disasters cost and will eventually shake the very foundations of Indonesia’s economy. To date, Indonesia has one of the world’s largest rainforest areas but the Indonesian Forestry Ministry and the Center for International Forestry Research show that roughly only one-third of these forest areas are covered by primary forests, one-third by logged-over areas and one-third by vegetation other than forests. Some scholars argue that forests in Indonesia are still disappearing fast. An article published in the 2014 journal Nature Climate Change suggests that the annual deforestation rate of Indonesia is twice the rate reported by the Indonesian government. To address this issue, the new government needs to adopt a policy that ensures that halting deforestation and peat land loss is the center of Indonesia’s development policies and programs. The current president, Susilo Bambang Yudhoyono, and his cabinet have managed to introduce forest and peat land conversion moratorium as well as establish a national REDD+ (reducing emissions from deforestation and forest degradation) agency. Such a policy and new agency, however, have already been confronted by a huge task, particularly in being seen to be inclusive, taking into account the voices and interests of various ministries, sectors, layers of governments, and groups of stakeholders such as from local communities and the private sector. The new government needs to realize that in a big, democratic and decentralized country such as Indonesia, any policy formulated or institution set-up needs all the support it can get to ensure that the desired changes can take place on the ground. The new government, therefore, needs to rethink its future cabinet structure that allows good coordination among key ministries, such as development planning, forestry, agriculture, energy and the environment, and key agencies, such as the national climate change council and the REDD+ agency. The new government will be judged by its selection of these ministers and heads of these agencies, and whether these leaders are those representing big businesses or willing to see Indonesia achieving sustainable development outcomes. In addition, the new president should be much firmer in showing his leadership so that any decision would be followed and applied by those ministries and agencies accordingly. Fred Stolle of the World Resources Institute, for instance, highlights this issue by stating that Indonesia has relatively good policies on forestry but the biggest challenge of all is to follow up the policies with effective implementation and law enforcement. This first 100 days of the new government, therefore, would serve as the period for Indonesians to scrutinize the selection of ministers and formulation of key policies of their elected president and vice president. In general, Indonesian citizens during this period, and even before, have to voice out and remind the elected government about the needs for significant transformation of the country’s current natural resource development, pushing for more efficient and sustainable use of natural resources. For the elected president and vice presidents, they have to show that they can lead Indonesia, by formulating and implementing their vision, policies and programs that bring about the country’s sustainable development outcomes. 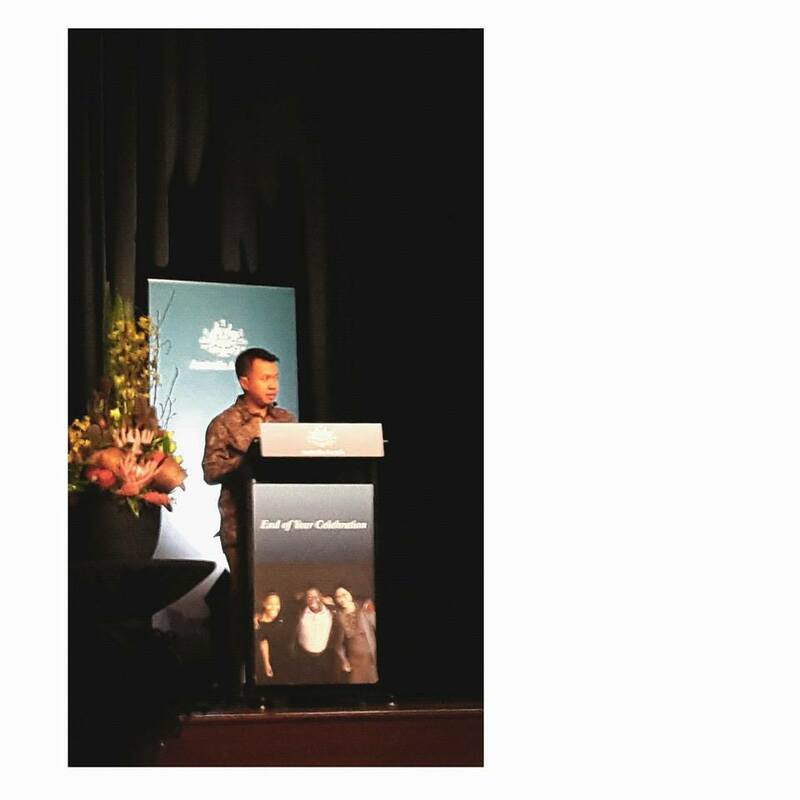 The author is acting executive director of Pelangi Indonesia, a doctoral candidate at the Australian National University, and the recipient of Australian Leadership Award and Allison Sudradjat Award. He can be reached at fitrian.ardiansyah@anu.edu.au. In his speech on a recent visit to Jakarta, the US Secretary of State John Kerry calls the world to pursue actions on climate change. This has propelled climate change back on the global news headlines. With the current negotiation on climate change at the UN level converging toward Paris in 2015, expectedly resulting in a global climate change treaty agreed by all nations, the statement made by John Kerry is like a breath of fresh air since many countries have been waiting for the US examples and leadership in this issue. A bilateral agreement between China and the US – reached a day before his visit to Indonesia – to cooperate more closely on combating climate change may potentially lead to wider and stronger commitments to curb greenhouse gases (GHG) by both and other big countries. Any positive movement and actions coming out from the two superpowers are significant steps toward reaching a global commitment. For Indonesia, actions from the two superpowers and wider global actions, including an agreed treaty, will definitely help and strengthen the country’s existing policies and programs on climate change. As an archipelagic nation, Indonesia has started to experience climate change impacts, and if not seriously dealt with, these could further put pressure on the country’s economy, society and natural environment, which include extreme and unseasonal weather, droughts, flooding and trans-boundary haze. At the same time, stronger actions on climate change at the global level are likely to provide a platform for Indonesia to decouple its economy from GHG emissions. Global agreed actions, particularly that include stronger commitments in terms of GHG emissions reduction, can in turn provide economic incentives for both state and corporate actors to reduce their emissions. Without such incentives, it will be challenging for an emerging economy like Indonesia that has a high and relatively steady economic growth, a huge natural resources base and projected population expansion, to reduce the growth of its GHG emissions. Sufficient economic incentives added with appropriate policies and programs can assist Indonesia to achieve balanced development – development that ensures economic growth and climate change mitigation. To be able to attain this, however, the government of Indonesia may require specific interventions at the national and sub-national levels in key sectors such as energy (with key commodities including coal, gas and renewables) and agriculture (with key commodities including palm oil). In the energy sector, Indonesia has significant resources and reserves of coal and gas, producing more this type of energy sources, not only for domestic consumption but also for meeting theexport demand. The 2012 data of the Energy and Mineral Resources Ministry indicate a persistent growth of production of coal, with the proportion of export reaching above 90 percent in the period of 2007-2009. The increased domestic use of coal means that emissions from coal, which was minor contribution in 1980s and remained below 10 percent until late 1990s, have spiked in the last ten years. In 2009, according to the Energy and Mineral Resources Ministry, the contribution of emissions from coal was almost 40 percent. The use of fossil fuels – i.e. coal, gas and oil – appears to continue playing an important role in the country’s energy mix in the future. Yet, to achieve a strong economic growth while ensuring the reduction of GHG emissions, Indonesia needs to dramatically boost investment in renewable energy and energy conservation (e.g. clean technology, eco-efficiency, eco-designs, etc.). Boosting and attracting investments require policy reforms, especially which relate to energy subsidies and fundamental institutional changes. Many economists believe that huge energy subsidies have hindered the development of Indonesia’s renewable energy and can lead to energy security issues in the future. In the agriculture sector, Indonesia has a challenging future in terms of providing food for its population. Several projections, for example, reveal that Indonesia’s rice consumption would exceed its production in 2020 and beyond. One of the possible factors causing this is likely to be the issue of land availability. If climate change impacts are taken into consideration, the agricultural production may fall below these current projected figures. Climate change not only could lead to the reduction of the volume of agriculture commodities produced but may also result in other related damages and costs. It is crucial, therefore, for the government to formulate policies and programs which ensure that the agriculture sector can cope with climate change challenges. variability, need to be further supported, especially at local level (i.e. ensuring farmers to have support so that they can increase their adaptive capacity). Such programs and the lessons-learnt resulting from these not only can help Indonesia to develop climate change adaptation in the agriculture sector but also contribute to the negotiation of global adaptation programs and funds. When it comes to discussing the agriculture sector, palm oil is undeniably one of the most important commodities for Indonesia. With the skyrocketing demand for palm oil over the past 25 years, the challenge of climate change (both in terms of the future demand for biofuel and issues associated with deforestation) and the increase in capability to produce more, world production of palm oil, including in Indonesia, is expected to nearly double by 2020. The amount of land given over to oil palms that has multiplied since the mid-1970s would even dramatically increase in the future. Such increase in palm oil production leads to challenges and opportunities for Indonesia. Immediate and future opportunities for Indonesia, among others, are to show good cases that the country can meet the domestic and global demand by promoting sustainable palm oil production. Key challenges include applying better land management, including no conversion forest and peat lands as well as the implementation of zero burning activities, and other GHG saving activities, including the use of POME (palm oil mill effluent) for energy and other uses. The speech made by the US Secretary of State serves as a good reminder for the US itself, China and other big countries, including Indonesia, that all nations have responsibilities toward addressing climate change albeit with different capabilities. When it comes to Indonesia’s domestic capability, the country needs to focus on its key sectors, resources and commodities. These sectors are both contributors to GHG missions and potentially affected by climate change impacts. Strategically focusing on these sectors and resources means a further burden for a developing country like Indonesia because it requires huge financial, institutional and social investments. It, nevertheless, also presents a good opportunity for the country not only to safeguard it against the threat climate change poses to development but also seize the economic opportunity that climate change presents. Let us hope the current and future governments choose their options wisely. The author is climate and sustainability specialist, a doctoral candidate at the Australian National University, the recipient of Australian Leadership Award and Allison Sudradjat Award, and Program Development Director of Pelangi Indonesia.